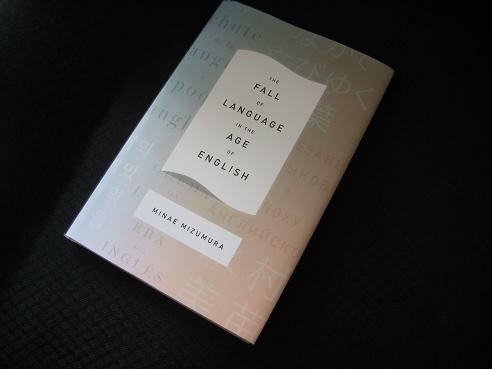 The Fall of Language in the Age of English (translated by Mari Yoshihara and Juliet Winters Carpenter, review copy courtesy of Columbia University Press and the Australian distributor, Footprint Books) sees the writer reflect on a topic which is obviously close to her heart, the state of the Japanese language. Proud of its heritage and the works which have been written in her mother tongue, she nonetheless fears for its future, believing it to be under siege from both internal and external threats. This is an area I find fascinating, particularly the development of the new written language enabling literature to spread (a topic I first encountered when reading Shimei Futabatei’s Ukigumo, AKA The Drifting Cloud), and when Mizumura focuses on the historical aspect of her topic, the book is at its strongest. Mizumura also introduces interesting ideas on the way writers from other cultures are affected by English. The book begins with an account of her visit to the International Writing Program in Iowa, presenting portraits of the other foreign writers present (including Kim Young-ha! ), all of whom, she claims, are finding their work and world view shaped by English in some manner. She also comes to realise that many of her fellow writers have to struggle with culture, history, politics and language (concepts which, for many people, are indistinguishable), becoming aware of how relatively fortunate Japanese is. Insightful, profound or copied from a Buzzfeed post? The choice is yours…. Poppy – I’d definitely go for ‘A True Novel’, a beautiful book (it does run to 800+ pages over two volumes, though…). It sounds mediocre, which is among the worst of crimes, and that final quote is banal. To be honest, I’m only leaving a quote for the sake of the fairies, as there doesn’t seem much to say on the book itself.